There are several ways that you can exfoliate your skin. There’s the day to day exfoliation that happens when you use a cleansing cloth or brush when washing your face. There’s also the exfoliation that occurs when you use a product that contains a type of acid, such as alpha hydroxy acid or salicylic acid. There’s also the type of exfoliation that occurs when you undergo a treatment, such as microdermabrasion, at a facial plastic surgeon’s practice. While any type of exfoliation you do at home will be very superficial, the type of treatment you get at a doctor’s office is usually more in-depth. Although microdermabrasion goes deeper than your typical face wash or Clarisonic, it’s still one of the most superficial of all of the treatments you can get from your doctor. 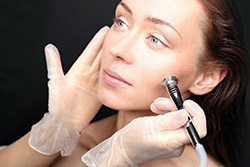 Microdermabrasion is ideal for treating the beginning signs of aging. The treatment helps reduce the appearance of very fine lines and wrinkles. It also helps fade any spots or areas of hyperpigmentation, as well as any mild scarring or darkening of the skin caused by blemishes or acne. If your skin tone is uneven, the treatment will help create a more even tone. Since it removes the outer layer of cells, microdermabrasion can also make your complexion look brighter and more vibrant. Don’t confuse microdermabrasion with dermabrasion, its much more in-depth and invasive cousin. During a dermabrasion treatment, a surgeon uses a wire brush or a diamond coated wheel to remove the outer layer of skin, creating a wound. You can expect to bleed and will need time to heal after dermabrasion. Microdermabrasion is much more gentle. There’s no bleeding and you’ll be back on your feet in practically no time. During the treatment, your surgeon will use a tool that sprays a stream of tiny crystals across your face. The crystals gently exfoliate the skin. Any skin cells and crystals are then lifted off your face using a small vacuum tool. Typically, the entire process of microdermabrasion takes less than 30 minutes. You can expect to go home right away and get back to your regular life immediately. Microdermabrasion isn’t right for everyone. It might be a good option for you if you have some lines, some spots or mild scarring. Although the treatment is minimally invasive, it helps to be in the best of health before it, to further reduce the risks for complications. In some cases, the signs of aging you are experiencing or your other skin concerns might be beyond the scope of what microdermabrasion can treat. The treatment doesn’t help reduce excessive skin sagging, for example, and won’t remove very deep lines or creases. In those cases, surgical treatments, such as a facelift, might be a better choice. Treatment also won’t help remove very large or deep scars. Microdermabrasion is also not recommended if you are in the middle of an active breakout or if you have recently had another type of skin resurfacing treatment, such as a laser treatment or a chemical peel. Your surgeon might also advise against treatment if you have uncontrolled diabetes or if you’re pregnant. As a minimally invasive treatment, the risk for side effects from microdermabrasion is pretty low. If anything, you might experience some discomfort or bruising in the treated area for a few days afterwards. Your skin might feel a bit tight, but you can minimize that feeling and ease discomfort by applying a moisturizer right after treatment and regularly in the days that follow. Protecting your skin from the sun is also important after a microdermabrasion treatment. Since the outer layer was just removed, your skin will be more sensitive to any exposure to the sun’s UV rays. Since it is so minimally invasive, most people usually need a series of microdermabrasion treatments to get the results they are after. Depending on your goals and expectations, you might have anywhere from three treatments to as many as 16 treatments. Your treatments can be close together, such as a week apart, or you might space them a month or more apart. How far apart your treatments are depends on how quickly you heal afterwards. If your skin still feels tender a week or so after a treatment, it’s usually a good idea to postpone a repeat treatment for several weeks. Dr. Shapiro’s office is happy to answer your questions about microdermabrasion and help you decide if it’s a good pick for you. To schedule a consultation with Dr. Shapiro and to learn more about your skincare and skin resurfacing options, call (480) 451-1700, Monday through Friday from 8:30 am to 5:00 pm. You can also reach him by email through our Contact page here on our website.